Skill Development in Counselor Education provides counselor educators in training with a variety of materials and suggestions to assist in building fundamental skills. Templates, activities, and quizzes guide educators in developing their identities and teaching philosophies, developing engaging curricula, teaching cultural and technological competence, and dealing with complex ethical issues in the classroom. The book also covers a variety of practical topics related to seeking a faculty position or navigating an academic appointment, including writing a CV and cover letter, preparing for interviews, and navigating the tenure process. 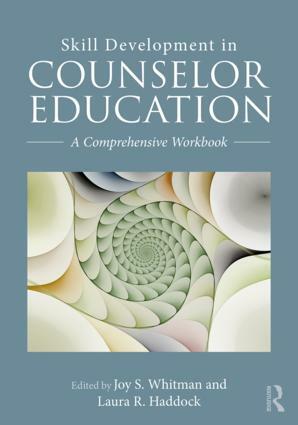 "Attention, counselor educators: This workbook has it all. Whether you are applying for your initial appointment or a seasoned professor, this workbook is a comprehensive toolkit for the profession. In this text, Whitman and Haddock include practical examples and helpful illustrations for developing your teaching philosophy, gatekeeping in the profession, curriculum development, classroom engagement strategies, and much more. A definite must for any counselor educator." Joy S. Whitman, PhD, is a core faculty member of Counseling@Northwestern at the Family Institute at Northwestern University and has over two decades of experience as a counselor and counselor educator. Laura R. Haddock, PhD, is full-time clinical faculty at Southern New Hampshire University and has more than two decades of experience as a clinician and a counselor educator.